On Thursday, June 8, the group convened at RocketSpace’s new London Campus steps from Angel tube station to learn about corporate innovation strategies and internal opportunities for disruption from the program’s collaborators, which include BP, Magna, IBM, Allstate, Avis Budget Group, and VW. The following day was spent exploring BP’s Sunbury facilities, where startups also pitched early solutions and engaged with corporate collaborators. “The kick-off event last week provided our team with a lot of really exciting ideas that we’re looking forward to pursuing. It was great to see such high calibre startups, brainstorming directly with a group of motivated corporate innovators. We look forward to seeing some positive results from the pilots in the program,” said Roy Williamson, VP Mobility, BP PLC. Following the London kickoff, startups returned home to begin a five-week virtual program, focused on corporate-led knowledge shares, piloting preparation workshops, and advanced business strategy sessions. When workshop sessions end in July, collaborators will select startups to engage in an eight-week pilot testing and product validation phase, where their solutions will be integrated and tested within various business units of the participating corporate collaborators. The eleven startups in this inaugural cohort come from the U.S., Canada, the U.K., Israel and India — representing a geographically diverse set of mobility solutions — and were chosen to represent the accelerator’s mobility focus of the electric vehicle ecosystem and connected car and associated services. Freewire Technologies (San Francisco) - FreeWire Technologies creates intelligent energy delivery systems and brings clean power to applications where never possible before. Carfit ( Portland) - By combining NVH vibration science and artificial intelligence, CARFIT leverages car’s vibrations with data science to revolutionize predictive maintenance. Neomatix (Tel Aviv) - Neomatix is automating external vehicle inspections using Computer Vision and Deep Learning algorithms. Driivz (Hod Hasharon, Israel) - Driivz is an innovative end to end EV(Electrical Vehicles) charging software platform, that serve as the operating systems for the world’s major EV charging Network providers. Caruma (San Francisco) - Caruma is an Intelligent Connected-Vehicle Platform that utilizes the underlying technologies found in autonomous driving vehicles to improve safety, security, and convenience. Volta Charging (San Francisco) - Volta partners with brands to build free-to-use, city-wide public electric car charging networks driven by media and data. 5D Robotics, Inc. (Carlsbad) - 5D Robotics (5D) is a software services company applying groundbreaking robotic innovations to make robots more intelligent and helpful. Altigreen (Bengaluru, India)- Altigreen is creating EV technology to democratize their use in emerging markets. Mojio (Vancouver) - Mojio is the software platform of choice for rapid deployment of cloud-based connected car apps, services and data insights that provide enterprises with access to untapped revenue streams and cost-saving opportunities. Applied Blockchain (London) - Applied Blockchain is a blockchain applications development company, focusing on distributed ledger technology and smart contracts. Civil Maps (San Francisco) - Civil Maps provides cognition for autonomous vehicles, enabling them to crowdsource continental scale, 3D semantic maps for safe driving. 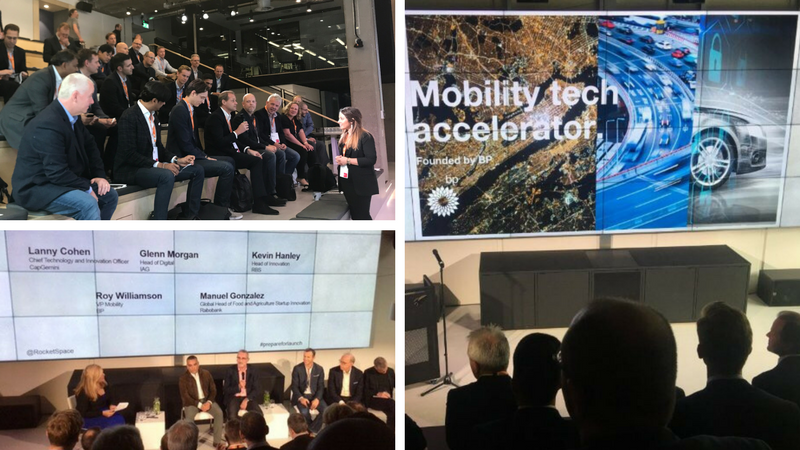 Learn more about the Mobility Tech Accelerator here!